Yeasted Doughnuts & Glazes Galore! 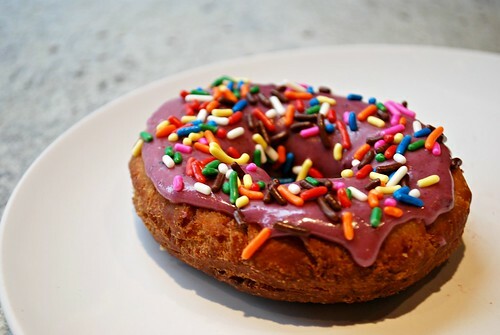 Doughnuts are a great way to start the day and bloom into the daily schedule. For me, they're best with a cup of coffee! I've been open to trying out milk alternatives to heavy cream in my coffee and one brand I especially like is Silk soy and almond milks. They're delicious and add a nice touch of flavor to my coffee and because it's plant based, it makes me feel better to use a healthier milk alternative. But aside from coffee, Silk is something you can incorporate into some recipes... like doughnuts and glazes! Slik products are proudly made without the use of GMOs. They are also a leading supporter of the Non-GMO Project and we are committed to ensuring all of their products receive the Non-GMO Project verification. Plus, the seal is displayed right on the front of most of Silk products. –  Monthly chances to win a year's supply of Silk! Or course, you can then take your dougnuts, glaze them with any of the several glazes below (which also can be made with Silk milk) and top them off with an assortment of toppings like color sugars, sprinkles, chocolate chips, mint chips, cherry chips, butterscotch chips, fresh berries, caramel sauce, chocolate sauce, powdered sugar, cinnamon sugar and/or even a vanilla pastry cream to fill them with! In the bowl of a stand mixer fitted with a dough hook, combine the 3 cups flour, sugar, yeast, and salt. Add the milk and eggs, mixing on low speed for 3 to 4 minutes or until ball of dough forms. Add butter 1 tablespoon at a time. Add ¼ cup flour, 1 tablespoon at a time until dough forms a soft ball while continuing to mix for about 3 minutes. Transfer dough to a lightly oiled bowl and cover with plastic wrap. Allow the dough to rise at room temperature or in a warm oven until nearly doubled in size, about 1 ½ hours. Turn out dough onto a floured counter and using a rolling pin, roll out dough to a ½ inch thickness. 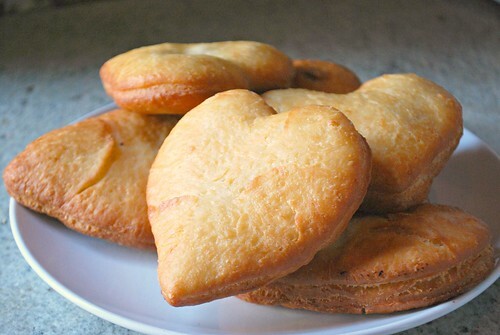 Cut dough using a 2 ½ or 3 inch doughnut cutter or desired cookie cutter. Place doughnut rings and holes on a floured baking sheet. Loosely cover with plastic wrap and let rise at room temperature or warm oven until slightly puffy, about 30-45 minutes. Heat 6 cups of vegetable oil in a Dutch oven or deep fryer to 375 degrees. Fry holes for 30 seconds per side and fry doughnuts for 40-60 seconds per side, turning as they rise to the surface. Remove doughnuts and drain on paper lined baking sheet or wire rack, returning oil to temperature between batches. After doughnuts have been fried, roll or glaze doughnuts. In a bowl, whisk together half and half /soy milk and vanilla extract. Add in sugar, whisking constantly. 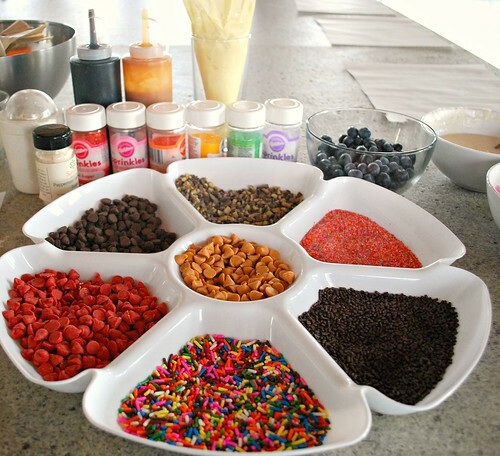 Either dip doughnuts or frost them with a small spoon, then cover in sprinkles or desired toppings. In a bowl, whisk together cream cheese and vanilla extract. Add in sugar, whisking constantly until smooth. Add more or less half & half/soy milk depending on your desired consistency. In a bowl, whisk together butter and maple syrup. 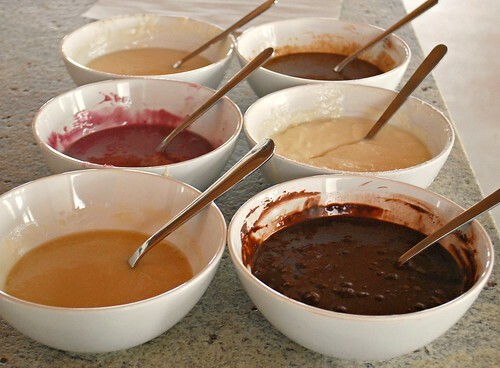 In a bowl, whisk together powdered sugar and cocoa powder. Add in half and half/soy milk and vanilla extract, whisking constantly until smooth. In a bowl, mash thawed strawberries and jam together with a fork. Add in sugar, whisking constantly until slightly smooth. Combine the sugar and cinnamon in a bowl or paper bag. Add donuts to bowl or bag, seal and shake to coat. Add powdered in a bowl or paper bag. Add donuts to bowl or bag, seal and shake to coat. In a saucepan, combine the sugar, 1 ½ cups of milk and vanilla extract. Cook over low heat, stirring constantly with a wooden spoon until the sugar is dissolved. Raise the heat to almost boiling. Meanwhile, in a medium bowl, add cornstarch and whisk in the remaining 1 ½ cups milk until smooth; then whisk in egg yolks. Slowly whisk in half of the hot milk mixture into the yolk mixture. Transfer the yolk mixture back into the saucepan and boil gently for 1 minute over medium heat. Remove from heat and whisk in the butter. Pass the mixture through a fine mesh sieve into a bowl. Cover with plastic wrap, pressing it directly onto the surface and refrigerate until chilled.